The relatively unexplored and untouched Chopta Valley in north east Sikkim is very popular among trekkers as well as people of several faiths. Chopta is famous for its monuments of historical and religious importance — from Chandrashila to the Tungnath Temple and more. The valley, at 13,200 feet, is a preferred destination for hiking, angling and water sports and the trek from Chopta Valley to Muguthang Valley is considered one of the best. 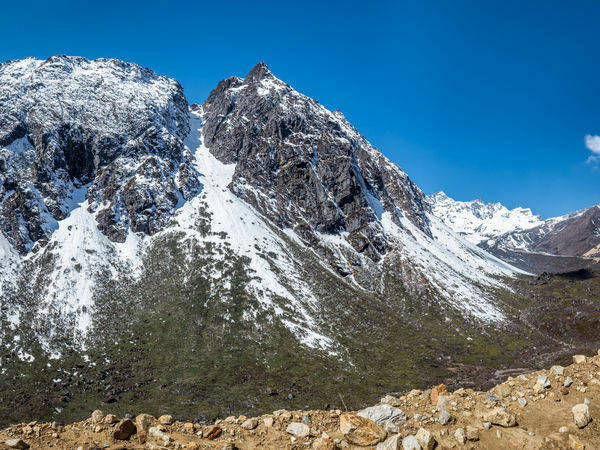 It lies in the Greater Himalayas at 15,500 ft. Trekkers are assured of scenic landscapes with snow-covered mountain peaks on one side and green pine forests and meandering rivers on the other. Tungnath Temple - Situated at a height of 3680 meters, the temple is dedicated to Lord Shiva. The temple is one of the Panch Kedar and Lord Shiva’s arm is worshipped here. According to mythology, Ravana performed penance to please Lord Shiva at this site. Chandrashila - It is the highest point on which Tungnath temple and Chopta are located. It is situated at a height of 4090 meters. From Chandrashila, one gets to see 360 degree panoramic views of the Himalayas. Chandrashila is summit of the Tungnath . It literally means “Moon Rock”. Thangu Valley - The Thangu valley is the most scenic of all in Chopta valley and even in North Sikkim. The alpine trees scattered around some wooden houses, the vegetation and the rare seen species of flowers are the major attraction of Thangu valley. High altitude flowers like orchids are also found in this valley. Trekking in Chopta valley - The Chopta valley is considered as a paradise for the nature lovers. The Chopta valley is about 2680 meters high above the sea level. This valley offers a great trek trails to the trekkers and adventure lovers. The trekking trail passes through the dense forest of rhododendron, pine and deodar. Best time to to travel to Chopta is in Summers (April – June) and Winters (Oct – Dec). Travellers interested in snow fall or want to experience snow trekking in Chopta then Jan to March are the best months.